In partnership with Adobe, Joy has put together a ‘Chinese New Year Survival Guide’ to help you navigate those dreaded questions, remember those four-word phrases, and gently remind you how to correctly address your father’s younger sister or your mother’s brother’s younger daughter. Read on as we look at how Joy highlights Asian representation in her work and makes examining people and culture a part of her creative purpose. Hi Joy! Can you please share a bit about yourself, your work and your story growing up as an Asian Between Cultures? — I’m honestly not one for great introductions. Since I tend to let my work speak for me, I find it pretty daunting talking about myself outside of the third person. Perhaps at my most basic, being basic, I’m just another part time adult trying to navigate life as a full time creative, with the added bonus of being Chinese Australian. My experience of growing up as an Asian in-between cultures is not so different to deja-vu. Answers played on repeat — the stories behind our names, where our so called country of origin is, and needing to explain why our appearance is geographically distinct from where we were born or raised. Like many, I’ve always been predisposed to satisfy other people’s curiosities with answers I have difficulty articulating let alone understanding, putting their interests and fascinations before reconciling my own. It was only a few years ago that I started to focus on my experiences of being a Chinese Australian, what that means and how this identity can visually exist at the intersection where design meets gender, race and cultural studies. What do you define as your creative purpose? — My creative purpose has always been to redefine how we express our experiences of the world and to look at the traditions that are a part our history in a way which is both cultural and political. Tell us a bit about how you’ve been able to use graphic design as a tool to raise awareness of cultural issues such as Asian stereotypes and representation. — For me, the design of something can change the way you feel, experience and understand a concept. I’ve always been attracted to the idea of design as both a functional and aesthetic experience. As a designer, I have the agency to communicate visually, to challenge and reimagine, and to look at new ways of articulating our identities through design. Li General Store was my major project from my honours year at uni. I had come up with my own store where I recreated alternative products like those you might encounter at your local ethnic grocery store. As a concept, it looks into the history around representations of Eastern nations in the West, where these objects have been viewed as way of constructing Chinese and immigrant identities. I designed each item to present a subverted view to remind us of the impact material culture has on our social perceptions of individuals. For example, the immigrant game of life reimagines the classic board game of our childhood if it were to be inclusive of the experiences of refugees and immigrants and their transition into their new lives in a foreign country. ‘Living as an Asian Girl’ was a project where I designed three posters that look into the impact that various racial and gendered structures have on Asian women in the west. It came about as a personal dive into my own experiences as a first generation migrant, of being confused and frustrated by the different expectations between two conflicting cultures and ideals. Being of the millennial generation, my work tends to speak to an audience informed by popular culture, social media and memes. These posters draw from a counter-culture that shows how humour, interactivity and divergent thinking can be used as ways to push agendas that resonate with each other. 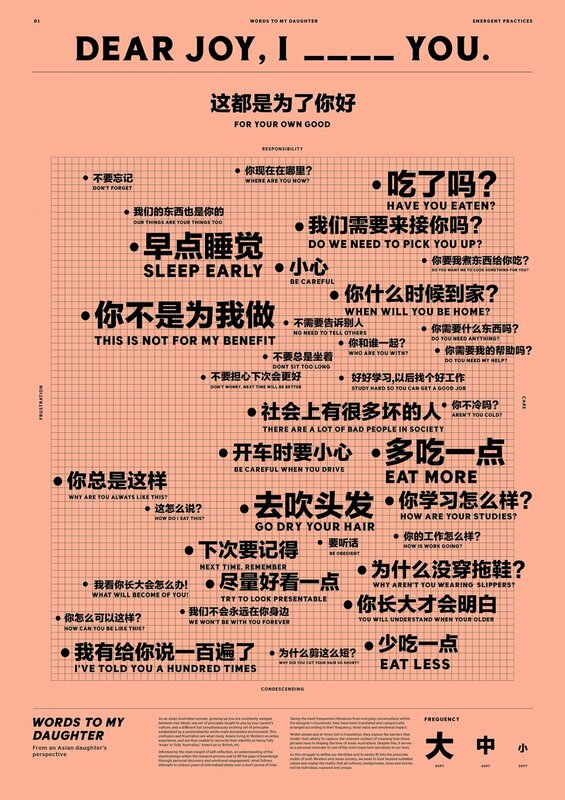 The Dear Joy poster is a personal yet surprisingly universal chart that translates the love language of immigrant parents. For the Sad Ballad poster, I used data scraping techniques to collate Twitter searches relating to 'Asian women' and ‘girls’ as form of digital poetry to graphically chart the varying opinions of these Twitter users. Who’s Your Token Asian presents the lose lose situation that Asian women must continually choose to fit into different societal expectations or risk being isolated by both sides. As a whole, the series is a representation of the contemporary lives of Asian girls living in Western societies, an intimate reflection on personal identity, family and society. My intention for this series is to convey a graphic portrayal the moments, phrases, people and forces that shape our lives which speak to the rhetoric of our time. To understand what it means to fill these moulds that have been pushed onto us. Your most recent project is your ‘Chinese New Year Survival Guide for ABCs’ , in partnership with Adobe. Why did you create it and what are some of the underlying themes/messages you wanted to get across? — I was asked by Adobe to create a piece of creative work for the upcoming Chinese/Lunar New Year. The ABC Chinese New Year Survival guide is a response to the unique experience many ABCs face during this festive season. From dodging condescending remarks from aunties, phrases of fortune to impress elders, all the way to watching your rice cake intake and knowing the familial terminology. Nothing says prosperous like a self-help guide to being the perfect son or daughter. As a functional piece of work, it presents practical solutions and offers information around the many facets of our shared experience. Whilst conceptually, it brings to light the inherent struggles ABCs have in navigating a complex cultural ecosystem. Why do you think your guide has resonated so well with ABCs who have accessed it? — I always equate the success of a work to being able to elicit the response of the face with tears of Joy emoji 😂 — not knowing whether you should laugh because it’s too true or cry because it too real. I think it resonates because ABCs share a common experience. As interstitial nomads, they’re forced to exist between two cultural experiences and navigate different expectations simultaneously. And something that can speak to their reality, which is rare, is something for them to hold onto. Was the guide influenced by your own experiences of Chinese New Year, or did you draw upon pre-thought scenarios / stereotypes / expectations? — There’s always an element of myself in my creative projects. Whilst speaking my own truth, it can resonate to others in different ways allowing them to form their own meanings. Whilst I’d essentially created the guide for myself, its content emerged from these understood scenarios and expectations. What do you see the link between your work and your cultural identity being? — Despite being brought up in a multilingual household, I find it difficult to verbally articulate all my thoughts in either language. Creating has always been a way for me to bridge this gap. It has been a space where I’m able to explain the things I feel or think where words sometimes fail to convey. My work has become a new language wherein I can express all the concepts I had previously struggled to define. How do you come up with the ideas/inspiration for your projects? — For any project, the audience and purpose will always be something that I respond to. Whereas inspiration can come from anywhere, and more often than not it originates from a place of personal experiences. I draw a lot of my visual inspiration from history and material culture because of its rich detail and craft. How will you be celebrating Chinese New Year this year — Hopefully as a seasoned expert, being the author of a CNY survival guide. Joy is a part time adult working as a graphic designer at Accompany, Sydney. Since graduating from honours at the University of Technology, Sydney, she has worked with a number of creative enablers such as Adobe, Microsoft Australia, Amnesty International and HP. Outside of the studio, her personal work examines the intersection where design meets gender, race and cultural studies. Sometimes her work has been worthy of feature on the likes of Buzzfeed and Monotype. Download her ‘Chinese New Year Survival Guide’ here. Get in touch with her here, or wander over to her portfolio or Instagram.